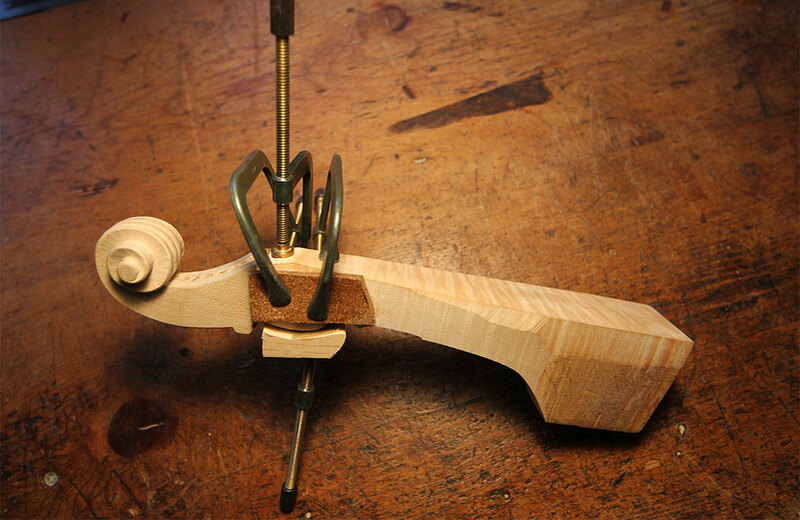 Neck grafting is a repair process for violins, violas and cellos through which the neck is replaced while often preserving the peg box and scroll of the instrument. As instruments age and are used, repairs become necessary to maintain the integrity of their sound. Starting in the 19th-Century, violin necks were crafted to be longer to give more sonic power to the violin to compete with other orchestral instruments. Whether the neck has broken, contorted or doesn’t suit the musician’s needs, neck grafts are a necessary part of preserving and optimizing a fine instrument. When performing a neck grafting on violins, violas or cellos, the process is basically the same. It is a process that requires the skills of a professional luthier (violin maker) in a reputable violin shop. The first step in the process is to detach the fingerboard and unhinge the neck from the mortise in the body of the instrument. Next, the old flamed or striped maple of the neck must be separated from the scroll and peg box, which is then trimmed in preparation to be grafted. The two upper peg holes, or sometimes all four, will be rebushed at this point. The old scroll and box are preserved, as they are a signature and personal expression of the original luthier and his craft. A new wood block is placed, and care is taken to match it to the figure of the original wood. The new neck is planed to fit smoothly into the prepared peg box so that the middle line perfectly aligns with the peg box and scroll. Next, the fingerboard is fitted to ensure the neck is cut for optimal playing. The neck is placed at the mortise for the best angle and bridge height. After perfecting the fittings, the violinmaker glues the graft to the body and scroll box. Finally, the luthier retouches the outside surfaces around the newly glued areas, and revarnishes the heel as well as the under side of the peg box. Upon completion, the only indicator of the grafted neck should be a glue line on each side of the peg box at the beginning and across the end.